Prepare Sugar Cookie Squares according to directions listed and allow to cool completely. Prepare vanilla frosting according to directions listed, then scoop out 1/3 of the vanilla frosting into a separate mixing bowl (about a heaping 1/2 cup). Tint remaining 2/3 of the frosting with red and yellow food coloring (a 1:2 ratio, for every drop of red add 2 drops yellow), add food coloring and stir with a fork or electric mixer until desired orange color is reached. Tint remaining 1/3 frosting with green food coloring until desired green color is reached. 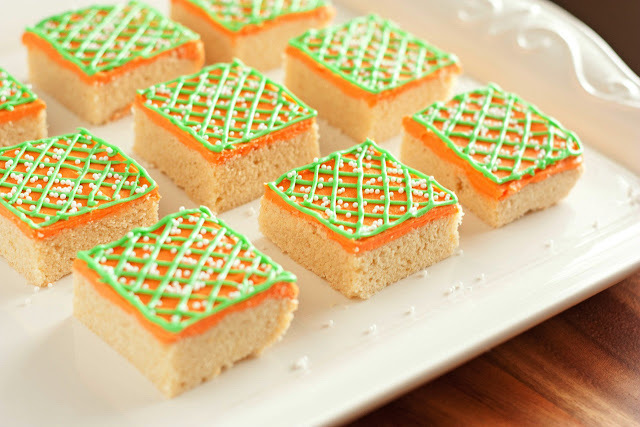 Spread orange frosting evenly over entire sheet of “cookie” then cut into squares (cookies). Scoop green frosting into a Ziploc bag and seal bag. Then using scissors cut a tiny end off one of the edges of the Ziploc bag (start tiny when cutting because this will determine the size when piping, you can cut more after testing the size of the pipe, if desired.) Then pipe diagonal lines in one direction over each cookie (see photos below), then repeat this processes making diagonal lines heading the opposite direction. Outline the edge of each cookie with green frosting. Sprinkle each cookie square with white sprinkles. Store cookies in an airtight container. Combine all ingredients in a large mixing bowl and using an electric mixer, whip until well blended and fluffy (I used to do this in separate steps but I really don’t think it’s necessary).